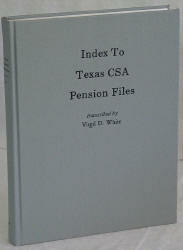 This index was taken from records prepared by the Georgia Pension and Records Department. The records from which these entries were taken are located at the Georgia Department of Archives and History, 330 Capitol Avenue, Atlanta, GA 30334. Confederate military personnel received pensions for military service performed for The Confederate States of America during The Civil War, 1861-1865. The pensions for veterans were first awarded in 1879 and the widows of Confederate veterans first received pensions in 1891. These pensions were paid to the veterans and their widows from 1879 to 1960. These pensions were paid to all qualified applicants who made application for a Confederate pension while a resident of the state of Georgia. The approved applicant received a pension regardless of whether the veteran or soldier had served in a Georgia unit or the unit of another Confederate state or a unit raised directly by the Confederate Government. This index contains entries for witnesses as well as the claimants. Information given in an entry will often vary from references to the same person or unit in another entry. If a record did not give any military service, the entry in the index will contain the note, "no service given". 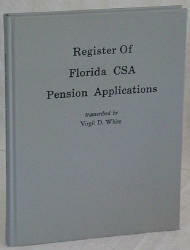 This register contains approximately 13,000 applications for Confederate pensions and has both an index for veterans and widows. 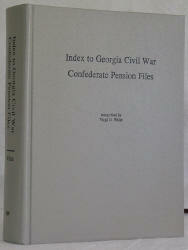 This index contains over 54,000 applications for Confederate pensions. 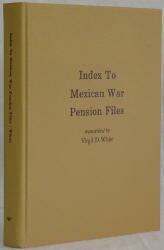 The entries in this index may contain the following; name of veteran and any aliases used, application number or if an approved claim the certificate number for both the veteran and widow where applicable, name of widow as well as sometimes the name of subsequent or former husbands and their service records where applicable, names of contesting widows and their application numbers, names of minor children or helpless children, date of claim and state or country from which claim was filed, unit or units served in, rank of veteran when in the military, date and place of death of veteran and some entries will give the date of death of the widow. There are cross-references to files in other series as well as cross-references for entries under more than one spelling.